Good Morning All, It only seems fitting that today’s Daily Post Prompt is Incubate. When my husband and were nearing in on our first anniversary, we knew exactly what we had wanted to do. I was always fascinated by birds and most particularly parrots. We would visit pet stores and talk with all different breeds of parrots, but the lessons we learned rather quickly was that the birds were all of a certain age already and that the bird needed to like both of us, and not select one parental unit. That in itself seemed near to impossible to find. One Sunday afternoon, my husband was reading the paper and came across a breeder out in Staten Island, New York. Right after reading, we called immediately to schedule an appointment after discussing the breed of bird we so wanted. The breed was an Amazon Yellow Nape. Two weeks later, we met the breeder who became known as “Uncle Tom” to both my husband and me, but as to Peanut as well. We were lead into a room with eleven other Amazon Yellow Nape parrots all ranking in age and size. We both stood there with our mouths wide open in awe of these beautiful creatures. After standing there, and checking them all over, this little fuzzy dude jumped off a perch and hid under my hair. I’m not gonna lie, he did look like this scrawny little gray thing with undeveloped wings. He was making this little noise that was like a baby cooing, and that was pretty much what stole our hearts. We had to go through a formal adoption process of residence, work, references etc… in order to adopt this little guy. Two weeks later we learned we were approved. Because Peanut was so young, he was held in an incubator for a few more weeks. But, then came the time we could take this funny little guy home. He looked enormous in the cage we bought him, and he still needed to be hand fed baby food. Today, Peanut will have an oatmeal pancake for breakfast, and a veggie rice dish for dinner, and of course I’ll be singing Happy Birthday to my little boy. Again, this is 30 years ago, but by going through a breeder the overhead cost of having to pay for a parrot in a store was cut out. We bought our baby at $800 and the cage for $250. I wouldn’t want to even think about it. Peanut is with me until my dying day though. I wouldn’t give up on him if my life depending on it. 80-100. He has the mentality of a 3- year-old, and never shuts up until he say’s “Mommy, night time, nite-nite” He constantly says he loves me, and for me to rub his little head while holding him in my robe. He’s my son. Oh, but you wouldn’t say that if he were to tell you off. He has his moments just like people. The great thing though is that the State recognizes him as a therapy animal. My psychiatrist approved of it. My Gran had a parrot which my Uncle her son used to try and teach it rude words. Bless him. Sorry to hear ypur Marriage ended mine too. He cheated. We divorced because we couldn’t live together. Soon after he was killed on his job site. It was 2013. We can be civil. That’s always a plus. That’s how my ex and I were. I’ve remained Single by my choice since Trust issues, mine. He said; he trusted me but I don’t think he did. Irony was Unlike him I was faithful. Most of us women are. Then again, I guess there are those who can’t stand to be married after a long while. I think he resented me going back to college. Started disappearing nights coming home later each morning so I confronted him about it. He cheated on our 1st year anniversary. And left me on Christmas day to be with her. That is just God awful. It was petty pathetic and immature. Birds can be so relaxing he is beautiful! Happy Birthday Peanut. Ahh – This story made me smile Beckie – happy birthday to you Peanut dear. I used to call my canary Buddy by the nickname of Peanut because he was brown with some black and white marking – told him he looked like a peanut. I will share this with my friend who is not on WordPress but has an Amazon Grey – I remember her telling me the same things when he was a baby and how he had to sleep on his floor as he was too small to climb up on the perch. I adore parrots, and Greys are very intelligent, but I longed for an Amazon Yellow Nape. 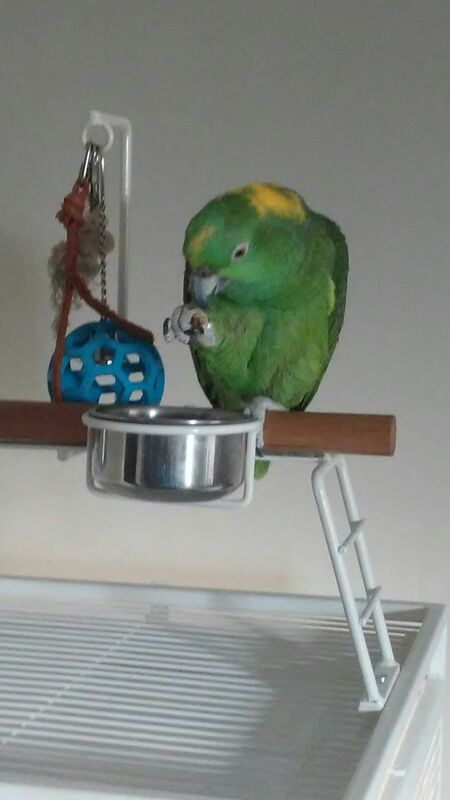 I used to have so many parakeets, and cockatiels, but I always wanted a parrot. My 4th-grade teacher inspired me and taught me a great deal about birds. 🙂 I love my teacher Ms. Musto. We had parakeets when I was growing up, then canaries in later years. My friend Ann Marie had an Amazon Grey for 25 years. Its name was Cookie. They took Cookie on vacation with them, often camping in the Upper Peninsula of Michigan. They had a huge cage on the front porch and would take Cookie and put him in it all Summer when they were sitting on their porch. In December 2014, her husband was baking bread and he was taking out the pans, and it slipped out of his oven mitts, and fell onto the oven rack and somehow caught on fire (gas stove). They couldn’t move Cookie out of the kitchen fast enough and he suffocated. They have no children, no relatives, just each other and so they went to a breeder, the same where they bought Cookie 25 years before, and got another Grey for as soon as it was ready to come home. She told me the same story of hand feeding and how she had to nurture him until he was older. Learned a lot about parrots from her. This one’s name is Digger. That is such an adorable name. I love it! Peanut use to have his own bedroom with a ladder to crawl down, walk down the hallway, and crawl up another ladder to his jungle gym. I miss those days. He would run around on that thing laughing his little but off. I miss my little Buddy so much – he was just the light in my day and he was very full of mischief. Are you friends willing Digger to a relative or friend when they pass? I can’t believe they had gotten him so late in life. I like how your little Buddy liked Christmas music/Karen Carpenter. Peanut love s Amy Grants “Baby, Baby” He also loves classical music becasue he sings opera. I like that Peanut sings opera – I think they like the softer female voices – he never liked Mariah Carey’s “All I want for Christmas” … but then again, I didn’t either … I like the traditional Christmas music or softer sounds. I am surprised they got Digger so late in life either. I know Ann Marie has a neice in California but that is all. They can live for many decades as you know – I want to say 50-60 or more years. Buddy, and Sugar before him, all liked to sing. I loved to hear them sing. I just adore all birds, quite frankly. They are fascinating creatures to me. Both Peanut & I love classical music and listen to it all of the time. You do make me smile with Peanut Beckie … it makes me think of Buddy and I called him Peanut and Button too … don’t know how I started calling him Button, maybe started to say Buddy one time and it came out wrong. Sugar used to have a swing in his cage and he loved to swing but even more he would go from a perch on one side of the cage to a perch on the other side (same cage as Buddy had) and he’d just sail through the swing, like a tiger jumping through a hoop, his feet didn’t touch. He’d be singing the entire time, sometimes would do it 20 times in a row. My mom and I would watch him, terrified he’d make a misstep and hurt himself. They were both very loved birds and they know it, just like Peanut does, and I think when they know how special they are to you, they show you their love as well.